Designed for a wide range of health, wellness and fitness applications, the Omnium1 is the world’s first full body, modular, portable, Android based pulsed electromagnetic field (PEMF) therapy mat system. The secret of PEMF lies in the improvement of microcirculation, the circulation of blood in the smallest blood vessels of the body. The Omnium1 therapy mat system delivers a specialized therapeutic waveform to target these very small blood vessels promoting improved blood flow and increased oxygen and nutrient supply to tissues and organs. This improved microcirculation increases the human body's ability to heal and repair chronic illness and injury. Each Omnium1 set includes cutting-edge applicators which mimic the earth's magnetic field in frequency and intensity providing unsurpassed health and wellness to the human body and mind. Contact us today to learn more about our amazing Omnium1 full body PEMF therapy mat system! Designed to be user friendly with clear menu options and simple touch icons for even the most novice tablet users to get started within minutes. Including the OmniMat, OmniPillow, OmniSpot and OmniBrain . The Omnium1 is designed to be fully upgradeable and inherently future proof. The Omnium1 is at the forefront of PEMF technology. Fully portable and configurable the Omnium1 fits into your lifestyle on your terms. 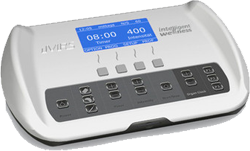 The Omnium1 exposes the body to frequencies within its natural range (.5-28Hz) causing each of your 75 trillion cells to resonate at its optimal frequency. In as little as 8 minutes cells are fully re-energized with effects lasting up to 6 hours. This optimal state activates the body’s natural self-healing ability, while balancing the body systems and helping to reduce or eliminate chronic conditions. With no negative side effects to the earth-based frequencies provided by the Omnium1 PEMF system, it is the most advanced, sustainable solution for an enhanced quality of life! Developed, engineered and designed in Switzerland the Omnium1 is the only PEMF system that employs the popular Android platform. It can be used as a regular tablet without any restrictions: surf the web via WIFI, send and receive emails, take photos and videos, or download and install popular apps from the Google Play Store. The OmniMat is a whole-body applicator that uses a triple saw tooth waveform form to efficiently deliver the full spectrum of human cell frequencies from 0.5-28 Hz. The Omnimat’s trifold design allows for compact storage and travel. It has six engineered, uninsulated copper coils that increase in size from head to foot providing a maximum flux density of 45 microtelsa.To achieve and maintain an optimal biological environment within the body it is recommended to use the Omnimat at least two times per day (ideally morning and evening). Engineered with proven research by NASA on square wave electromagnetic waveforms, the OmniSpot and Omnipad are designed to deliver effective pain relief, while improving circulation and accelerating healing. 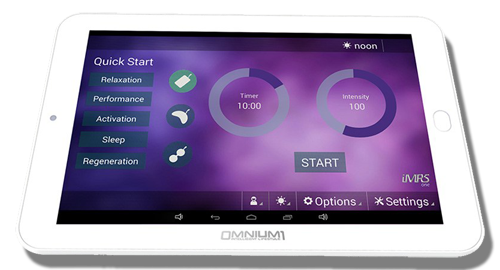 Omnium1 localized applicators are extremely versatile allowing you to incorporate your PEMF sessions into your existing routines. The Omnipad is designed with two engineered, uninsulated copper coils providing a maximum flux density of 70 microtesla. The Omnispot is a slightly smaller, more versatile applicator that is also designed with two engineered, uninsulated copper coils that provides a maximum flux density of 120 microtesla. The Omnispot also has the unique feature of delivering the Helmholtz effect. The Omnibrain uses brainwave entrainment, a method of mental training that has been used for decades employing sound, light, and color. Often described as a “spa for you brain”, it works seamlessly with your Omnium1 to melt away stress, improve oxygen circulation to your brain, deepen your ability to enjoy relaxing, restorative sleep, and naturally improve emotional balance without drugs or side effects. With brainwave entrainment people have reported improved cognitive function, mental clarity, focus and memory, as well as reduced levels of stress, depression and anxiety. Modern, modular, intuitive and intelligent. Four cutting-edge solutions to choose from. It is unbelievable to me how much the Omnium1 PEMF system has changed me as a woman! I am certain it is adding years on to my career as an athlete. I just wanted to send a quick note to let you know how happy I am using my magic carpet!!! I have suffered repeatedly with neck and shoulder pain since a rear-end collision in 2004. Chiropractic, physiotherapy, massage all brought temporary relief. It only took using the quickstart programs for 10 days for the neck and shoulder pain to stop returning after my chiropractic adjustment. Lifesaving miracles, not just the small stuff. I’ve had surgeons personally call me to ask what I was doing with their patients because they had never seen recovery like this in scenarios like organ failure, cancer and major reconstructive surgeries! It just amazes me that this isn’t mainstream medical! I recovered from a bad stroke, it helped me regain my voice.